Thornback cowfish larvae (Lactoria fornasini) were raised from wild-spawned eggs at 77-79F on wild copepods and artemia. First record of Thornback cowfish culture. The Thornback Cowfish (Lactoria fornasini) was cultured many times throughout 2012 and 2013 for this project. L. fornasini eggs are large (1.8 mm), contain multiple yellow oil globules and are covered in yellow pigment spots. They have a long incubation period (80+ hours) and were collected frequently throughout the year. L. fornasini larvae have a yellow pigmented, bulbous body and measure 2.9 mm at hatching. They start to feed on 60-80 micron copepod nauplii 4 days after hatching. L. fornasini larvae have no pelvic fins. The hexagonal bony plates begin to form just prior to flexion, near 3.1 mm TL, and are fully formed when flexion is complete 4.5 mm TL (14-18 dph, depending on water temperature). At this time (postflexion stage) the horns start to develop and the larvae become pelagic juveniles. L. fornasini juveniles have fully formed horns and adult pigmentation (bright blue spots) after 60-70 days. Survival to market size (2-3 cm) is very high. Juvenile Thornback Cowfish (Lactoria fornasini) in Indonesia. Fifteen 1″ captive-bred L. fornasini juveniles were kept in a 40-gallon aquarium together with juvenile groupers and snappers for several months during this study. 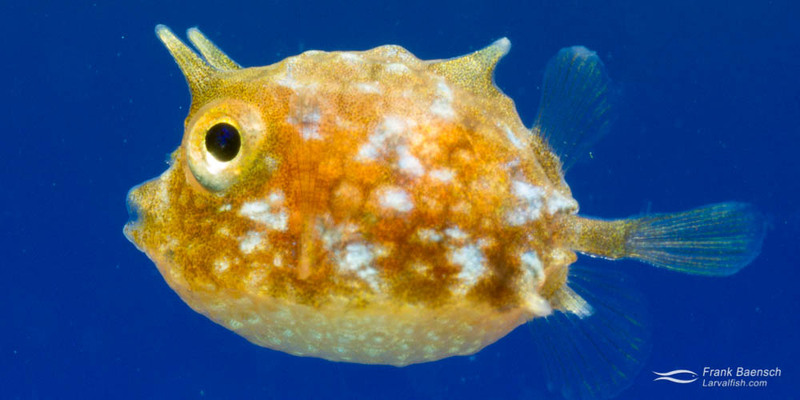 While juvenile boxfish are less likely to release toxin than adults it is still interesting to note that despite the high stocking density, aggressive tank mates and one cowfish death no poisoning was observed in the tank. Could these cultured cowfish be non-toxic? Recent research may shed light on this. Pufferfishes also produce a potentially lethal toxin, called tetrodotoxin. This toxin is primarily stored in the liver and ovaries and is usually not released like ostracitoxin. Pufferfish (fugu) has been a Japanese delicacy for centuries and many people have been poisoned despite strict preparation guidelines to remove the toxic tissues. In 2003, Japanese researchers discovered that symbiotic bacteria (certain species of Pseudomonas sp. and Vibrio sp.) present in the fish’s natural diet are responsible for synthesizing tetradotoxin. Non-toxic pufferfishes are now being farmed in Japan simply by restricting their diet. Thornback Cowfish (Lactoria fornasini) larvae raised in the laboratory.